One of the littles had his very first ever day of school. So me, being the bestest most awesomest aunt ever, made that little a celebration, hooray for school, banana ice cream cake. This little has been bugging me for a while now to make him an ice cream cake. It all started a few months ago when I gave him a bowl of banana ice cream and told him that when he sleeps over he can have ice cream for breakfast That blew his little mind. We then proceeded to have a converastawtion about healthy food and what was ok to eat for breakfast. (He is very interested in being healthy) I then told him that whenever he sleeps over I would make a banana ice cream cake for breakfast cause bananas are healthy. But every time he is over, I never seems to have enough bananas. The stuff… Crispy rice cereal, peanut butter (I have some chiunky stuff at the moment, but any nut butter is good) and 4 frozen chopped up bananas. 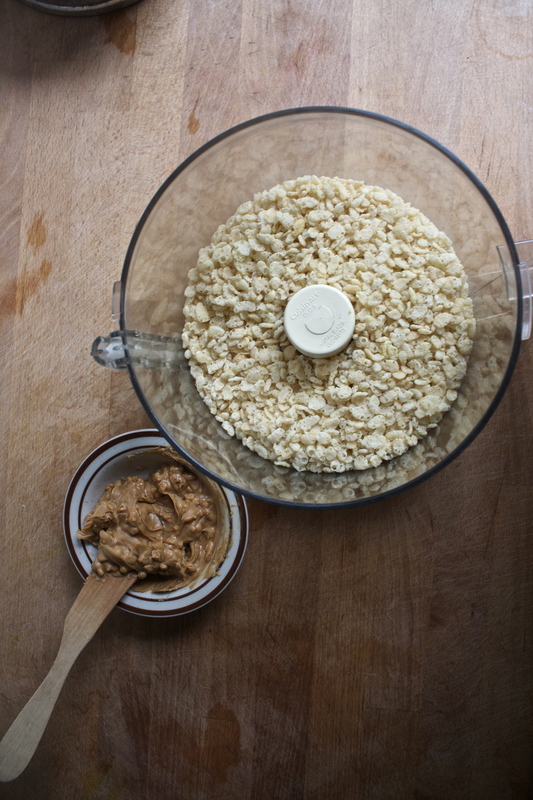 Rice ceareal goes into a food processor with the peanut butter. Pulse until everything is all combined and starts to come togerter. And ump the mixture into a spring for pan. If you do not have a spring form pan, a pie plate will work just as well. Such a nice looking crust if I do say so myself. Now stick it in the freezer while you make your ice cream. Frozen bananas go into the processor, get blended for a few mounters, and come out as ice cream…. freaking magic! Now dump the magic ice cream into the crust. And smooth it all nice like..and into the freezer it goes until its frozen. Go crazy! Toppings all over! And serve up, and watch out.. I almost got my hand eaten for kids going for seconds..
Have a fantastic day and happy back to school. to littles and parents alike! 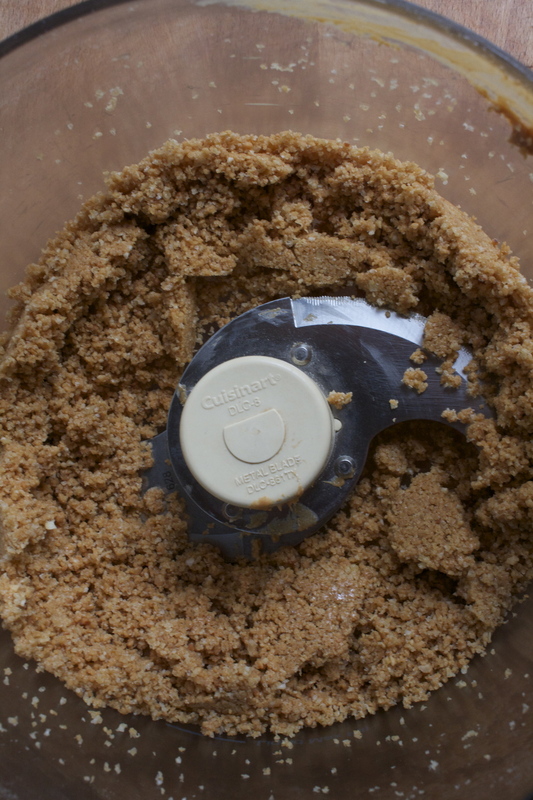 Place cereal and peanut butter into a food processor and pulse until crumbly and combined and starts to come away from bowl. 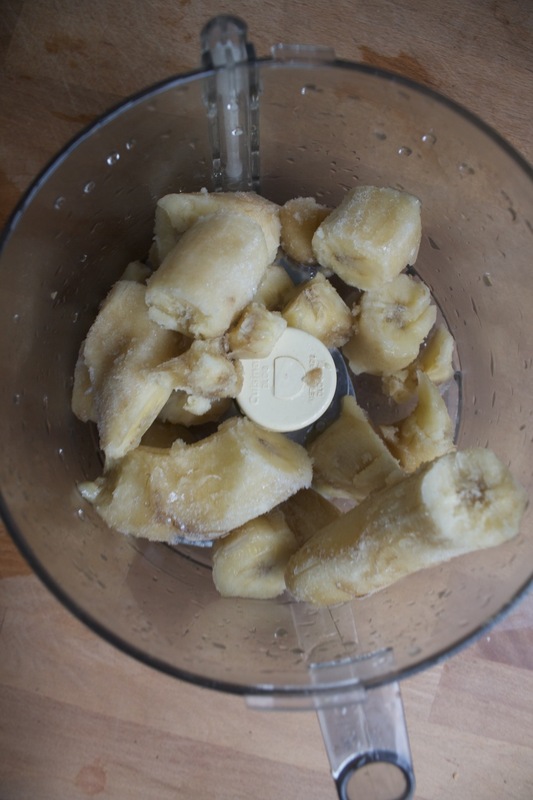 Take bananas out of freezer and place into food processor. Blend until smooth. If needed, you can drizzle a tiny amount of water into it if you think it needs a little help to blend. Once smooth, take crust from freezer and dump the nanaer ice cream on top and carefully smooth it out. Stick back into freezer (a pier of plastic over to prevent ice crystals )for at least 2 hours, or until the ice cream has completely frozen. When it's time to serve, remove cake from spring form (or leave it in the pie plate).and drizzle the top with melted peanut butter, melted, chocolate and another handful of crispy cereal. Or leave it bare. Or add sprinkles… the toppings are all unto you! Eat like a camp, for breakfast or dessert.. Or eat some for dessert and then some for breakfast.